Fusitriton oregonensis (Redfield, 1848) belongs to family Ranellidae (the so-called "tritons"). This species lives today most commonly in cool and relatively deep waters from the Bering Sea to northern California. It has been reported in Japan, and it has been reported (mostly as a fossil) in southern California. It is the state seashell of Oregon. The floating larvae of F. oregonensis can last for an extraordinarily long time (up to 4.5 years), and this would explain why it can be found in Japan today. This species has a medium-size shell (4 to 5 inches in length) with an overall fusiform shape. Its six convex whorls have 16 to 18 axial ribs nodulated by the crossing of weaker spiral ribs. 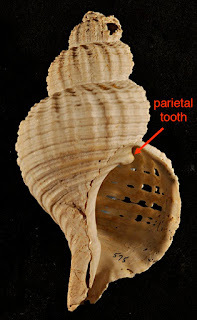 There is a single parietal tooth near the top of the aperture. The picture above is an apertural view of a modern specimen 87.7 mm height (3.5 inches) from beach drift at Friday Harbor, San Juan Islands, Washington. If you have ever visited the area, you will known that the ocean water there is cold enough to discourage a normal person, without a thick wetsuit, from swimming in it. The holes you see in the shell are the result of exposure to erosion while the shell was on the beach. At Friday Harbor, this species is intertidal. Southward, it lives in deeper waters (up to several hundred meters). Abapertural view of same modern specimen. The fossil record of F. oregonensis is from approximately middle Pliocene (approximately four million years ago) to recent. The two pictures shown below are of a fossil specimen 55.5 mm height (2.2 inches) of late Pleistocene age (30,000 to 50,000 years old) from a marine terrace at a beach cliff near Santa Barbara. The shells in this marine-terrace deposit lived during the Wisconsin Glacial Stage, which was the fourth and last stage of the great Pleistocene Ice Age. Based on a comparison with modern bathymetric, temperature, and geographic ranges, the shells indicate a maximum water depth of 10 m and a temperature range from 11 to 20 degrees Celsius (cool temperate). This would have been cooler than the sea temperature off Santa Barbara today but similar to that off the northern California coast today. 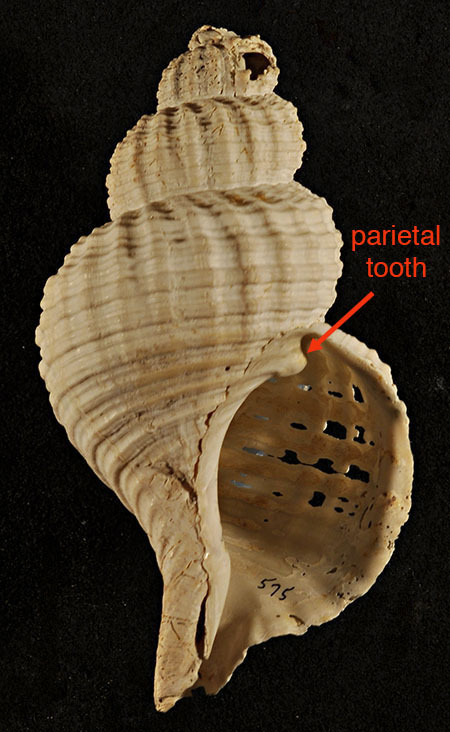 Apertural view of a fossil specimen missing its upper part. Abapertural view of fossil specimen.